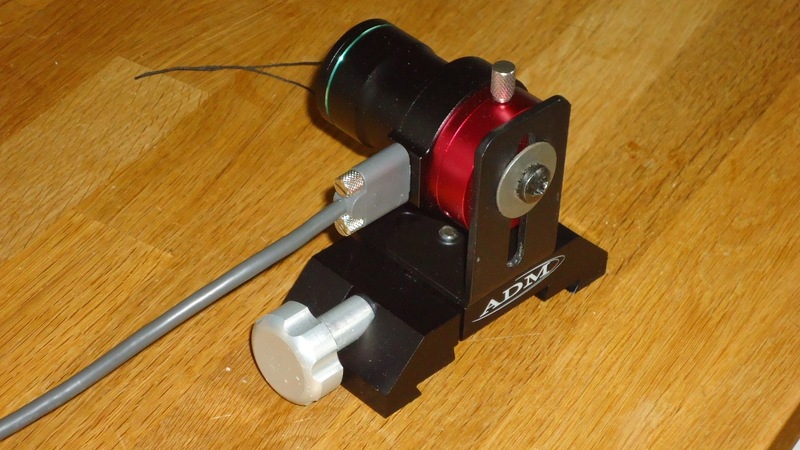 ZWO makes a nice ring to support the cooled cameras, but the uncooled cameras have a threaded 1/4-20 hole on the back and a smaller body diameter so the ZWO ring won't hold it. There are a number of solid low-profile camera mounts available for dovetails but they all assume the 1/4-20 hole is on the bottom of the camera, not the back. 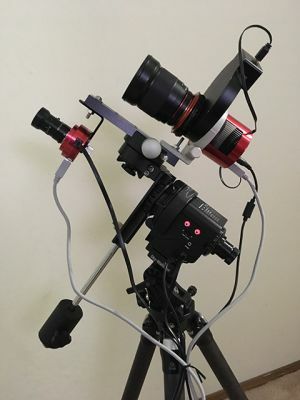 At the moment I'm using a larger camera mount I had sitting around that can bend at 90 degrees but it seems less than ideal in terms of both size and solidity. The obvious solution would be a nice heavy aluminium right angle bracket with a couple of holes, one for camera and one for dovetail, but nothing like that seems to exist. I'm probably going to end up with a pair of 90mm rings - overkill for the 55mm lens but probably required for the 200mm lens - but it seems surprising to me that nobody offers right angle brackets for dovetail mounting. Any ideas ? Could a ADM Polemaster mount be used if a 1/4" hole was drilled into the bracket? That's a lot closer than anything I have found - thanks ! The hole would probably need to be drilled a bit off center (ie closer to the top of the bracket) for clearance but that should still work. I found a heavy duty 90 degree angle piece at a hardware store for $10 and I just drilled holes for the mounting bolts. If you were worried about pointing you could shim it into alignment with the main scope pretty easily and since you will never need to touch it again you're done. Thanks. I didn't have much luck finding small heavy duty brackets, but I might just need to look more places. There are a lot of big (10"-12") solid brackets but the small ones were all pretty light. Best I could think of was clamping 2 or 3 of them together and drilling through the set. My rings arrived yesterday but it turns out I made a bit of a mistake - I had initially been looking at the VR90 rings (Vixen only) which have small mounting clamps, but changed just before ordering to DVR90 because the clamps seemed more solid. Will try with 200mm lens tonight and maybe that will let me get both rings onto the camera/lens set. I used this for this set up. Perfect... looked it up on Amazon Canada and found it, plus what appears to be the same thing under a different brand for $8.29 CDN including free shipping... ordered. Edited by bridgman, 22 March 2019 - 05:07 PM. It might be handy for other stuff too. I rummaged around in my "Ye Olde Junque Box" and came up with a nice 90° bracket which I bolted to a DA dovetail adapter. Edited by CCD-Freak, 22 March 2019 - 04:39 PM. Hah... and *that* is exactly what I pictured in my mind - figured *someone* must make one. That will be my fallback in case the binocular holder I just ordered is not sufficiently solid. Thanks ! Edited by bridgman, 22 March 2019 - 05:04 PM. The bino bracket should work pretty well. This one Orion has should work great. I have a similar one I use with my 11 x 80 binos which are much heavier that a small camera. Here is the bracket I found in my "Junque Box" mounted on a dovetail adapter. Shown with my Pole Master camera which is what I use it for most of the time. Sky-Watcher Star Adventurer dec bracket works perfect with head reversed. It already has a Vixen dovetail. 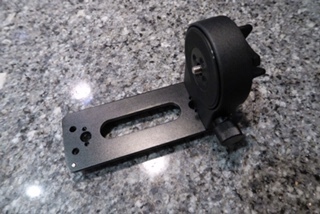 I made the black bracket out of 2.5" heavy wall aluminum angle, cutting a 2" wide piece. I drilled and tapped two 1/4" x 20 holes to mount it on the Vixen dovetail. The nut and bolt you see on the dovetail is just an extra. To mount the camera I drilled a 1/4" hole to use the winged bolt, salvaged from an old lawnmower. I cut a square piece of Kydex and glued it on with contact cement (sparingly) so the camera wouldn't contact the aluminum and get scratched up. The hole in the Kydex is a bit less than 1/4" so it holds the winged bolt in place. You can see the Kydex in the picture of the bracket. A plus to using the winged bolt is that I can loosen it to rotate the camera to orient the image to my liking. 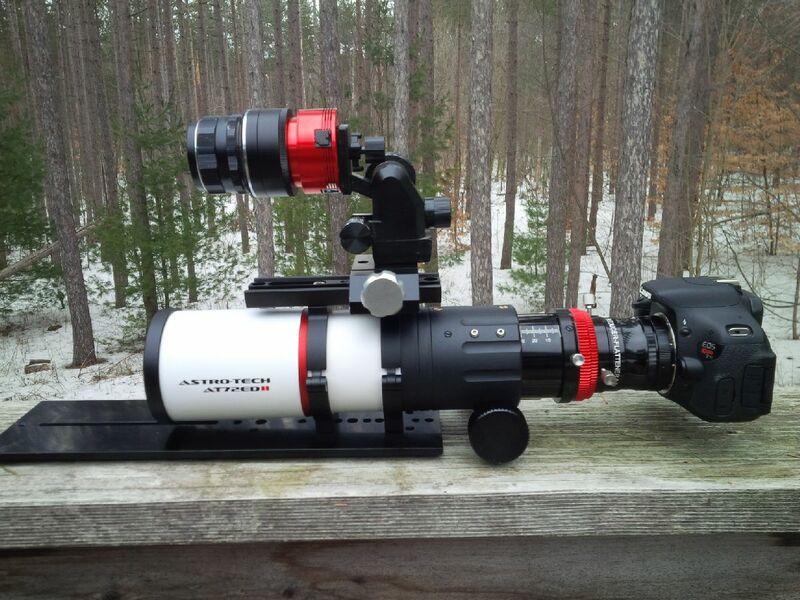 I can pair up my ASI290MC with my Canon lenses for some really wide fields. BTW, the setup in the pictures is solid as a rock, no vibration issues whatsoever. If for some reason you can't make this simple bracket yourself, contact a high school and see if the students/teacher can make the aluminum bracket for you in their metal shop. You can finish sand it and paint it easy enough, and glue a pad on where the camera makes contact. I made mine using a hacksaw and miter box to cut the bracket, and a small drill press for the holes. I tapped the two 1/4" x 20 holes by hand, using plenty of cutting oil. Edited by Ed D, 22 March 2019 - 08:09 PM.